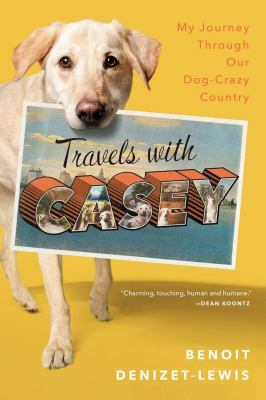 “I don’t think my dog likes me very much,” New York Times Magazine writer Benoit Denizet-Lewis confesses at the beginning of his journey with his nine-year-old Labrador-mix, Casey. Over the next four months, thirty-two states, and 13,000 miles in a rented motor home, Denizet-Lewis and his canine companion attempt to pay tribute to the most powerful interspecies bond there is, in the country with the highest rate of dog ownership in the world. On the way, Denizet-Lewis-known for his deeply reported dispatches from far corners of American life – meets an irresistible cast of dogs and dog-obsessed humans. Denizet-Lewis and Casey hang out with wolf-dogs in Appalachia, search with a dedicated rescuer of stray dogs in Missouri, spend a full day at a kooky dog park in Manhattan, get pulled over by a K9 cop in Missouri, and visit “Dog Whisperer” Cesar Millan in California. And then there are the pet psychics, dog-wielding hitchhikers, and two nosy women who took their neighbor to court for allegedly failing to pick up her dog’s poop.